In a small saucepan, melt the bittersweet chocolate with ½ of the heavy cream on medium/low heat until smooth. Set aside (or refrigerate for a short time) to cool completely. Meanwhile, using an electric mixer, whip 2 cups of heavy cream with ½ cup of confectioners sugar & 1.5 teaspoons of vanilla extract until stiff. In a medium bowl, whisk together the pumpkin & marshmallow cream. Gently fold in the whipped cream to the pumpkin mixture, working in 2 batches. Refrigerate. Add the remaining 1.5 cups of heavy cream & 1 cup of confectioners sugar to your mixer bowl & whip until thickened. With the machine on, slowly add the cooled chocolate mixture & the remaining 1.5 teaspoons of vanilla extract; beat until stiff. Spread half of the chocolate cream in a 4 quart clear bowl or trifle bowl. Layer with one-third of the toffee. Stand 8 cookies on their edges around the perimeter of the bowl. Then, make a layer of cookies in the inside of your cookie circle, laying these cookies flat instead of upright. Spread a layer of pumpkin cream on top of the cookies; then the remaining chocolate cream, another ⅓ of the toffee, followed by the last layer of cookies. 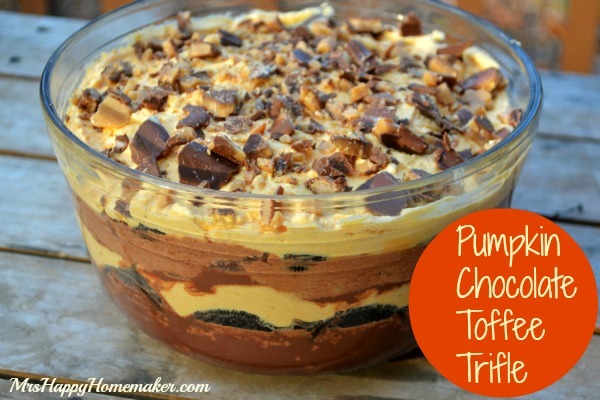 Top the trifle with the rest of the pumpkin cream & toffee. Cover & refrigerate at least 6 hours and up to 24 hours.